With a brand new HOT TUB for the 2017/18 ski season, there is yet another reason to stay at Sixt Alpine Chalet!! Relax tired ski legs whilst taking in the great mountain views in total peace and quiet! The heart of the chalet is the amazing 50m2 open plan lounge and dining area, with a cosy wood burner and superb views of the valley and village below. Equipped with TV, DVD and UK tv as well as PlayStation, Hi-fi seperates and Home Cinema, the lounge is the ideal place to relax after a day of mountain activities. There are 3 big, comfy sofas so plenty of seating for all our guests. The chalet also has a separate, fully equipped kitchen with dishwasher and microwave. The large (flat!) garden is secluded and private with sun all day in the summer - perfect for evening BBQs after sunbathing! We only offer FULLY CATERED accommodation in the winter season. Please see our website - www.SixtAlpineChalet.com for prices and availability. The availability on this site is NOT indicative of actual availability. 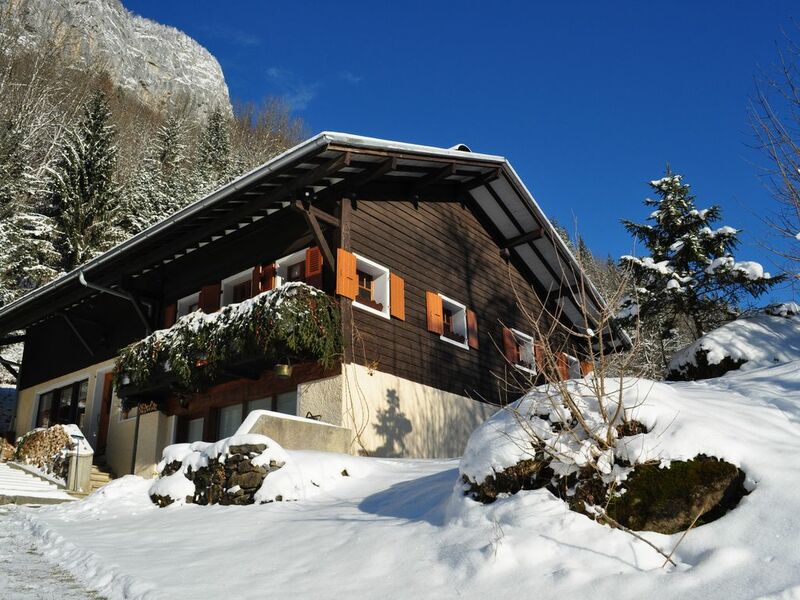 Located within the Grand Massif ski area, the chalet is perfectly located for accessing the lifts at Sixt or Samoens for skiing the 265km of piste. There is Nordic skiing just a few minutes walk from the chalet with a network of pistes running from the Fer a Cheval to Morillon. For non-skiers, there are several snow-shoe trails accessible directly from the chalet, with plenty more within a 30 minute drive. The village of Sixt becomes a mountain sport heaven in the spring, summer and autumn! River rafting and canoeing start 2 minutes walk from the chalet, running through the impressive Gorge des Tines to Samoens. Rock climbing and a Via Ferrata are located just 2 minutes drive from the chalet and numerous mountain walks start from the village. The network of mountain refuges are open from June to September where you can stop for coffee, lunch or B&B!! There is road and mountain biking on the doorstep and some of the ski lifts are open in July & August for walkers and mountain bikers. Outside of the school holidays, the mountains are quiet and offer stunning solitude and peace. The weather in May, June and September is often perfect for mountain sports with cooler temperatures than July & August. Sixt Alpine Chalet is owned by Sean who is very ably assisted by his wife Julia. Sean has been venturing into the mountains of the UK, Europe and Himalaya since the age of 10 and is an experienced walker, climber and skier. A BASI qualified ski instructor he loves to share his passion for the mountains with guests. Julia is a relative new-comer to the Alpine life but has quickly become a competent skier and also enjoys climbing and hiking in the summer. She has taken the standard of the chalet cakes to a new level and is always trying new dishes out on our unsuspecting guests!! I originally purchased L'Alpee during our very first visit to Sixt in 2004, after falling in love with the chalet and it's location. We spent 18 months renovating a shell of a building into a comfortable and welcoming chalet enjoyed by all our guests.The owner-run chalet is open all year round with each season offering a different experience. The area is unspoilt and tranquil, yet with plenty going on during the summer and winter seasons. Sixt Alpine Chalet occupies a unique position above the village of Sixt Fer a Cheval - one of only '200 most beautiful villages' in France. Benefitting from sun all year around, the chalet has become a haven of peace and tranquility for our guests who come back year after year to unwind and be spoilt. With no noise other than the church bells, Sixt Alpine Chalet is the perfect location for a relaxing and reviving break in the mountains - 12 months of the year. Can be available if requested. Free wi-fi throughout the chalet. Hi-fi seperates with Bluetooth connectivity. With outside table, chairs and parasol. Situated in Sixt Fer a Cheval part of the Grand Massif ski area. The chalet is 5 minutes drive in our minibus to the slopes at Sixt and under 10 minutes to the gondola in Samoens. The Grand Massif offers 265km of pistes and is an excellent area for all ability of skier. There is extensive off-piste skiing as well. Sixt is linked to the other resorts of the Grand Massif by the famous Cascades piste - a 14km blue piste running from Flaine (2500m) to Sixt (800m). Golf courses in Flaine, Chamonix and Les Gets. Brand new hot tub for the 2017/18 ski season! Luxury 6 place Caldera hot tub. Hot tub not available in the summer. Notes on accommodation: Chalet L'Alpee has 4 bedrooms as follows; Bedroom 1 - double room with large windows giving great views to the Pointe de Sales and the village. The bathroom has a bath and shower overhead. Bedroom 2 is a twin room with en-suite shower room. Bedroom 3 is the family room with double bed and full-size bunk beds. There is an ensuite shower room. Bedroom 4 is a twin room with ensuite bathroom with shower overhead. It is possible to put an occasional bed in this room making another family room. The kitchen has been created specifically for catering for large groups and is superbly equipped with Fridge/Freezer, Cooking Utensils, Gas and Electric cookers, Food Processor, Dishwasher, Toaster, Crockery & Glassware, & Microwave. Outside: Large gravelled area with picnic table and chairs. Reclining sunloungers. Private 800m2 garden with fabulous 360 degree views. BBQ and Firepit. There is private parking for up to 3 cars. Thanks for your review Nick and very glad you enjoyed your time in Sixt! We have just spent a very happy week in this chalet in the picturesque hamlet of Sixt-Fer-à-Cheval, enjoying walking, rafting, sunbathing, swimming in the river, a day at Lake Annecy and drinking in the beauty of the Alps. The chalet had everything we needed (we had failed to spot that there is no washing machine in the guests’ part of it but Sean kindly let us use theirs) and the garden is a lovely sun-trap with several sun-loungers and space for football games. The kitchen was superbly well-equipped (including some beers in the fridge and a bottle of red wine on arrival!) and the living area was incredibly comfortable. As a family of 7 we appreciated the 3 big sofas, big dining tables inside and out, and spacious bedrooms. Our dog had amazing walks and liked sunning herself afterwards in the garden. Highly recommended for family holidays! Many thanks for the review Hilary! It was a pleasure to meet you all and really glad you enjoyed your holiday in Sixt. As part of improvements to the chalet for next summer, there will be a washing machine in the guest part of the chalet. Séjour fabuleux : un bijou de chalet, une bouteille de vin blanc local qui nous attendait en guise de bienvenue, un paysage à couper le souffle (servi par un splendide soleil). Les chambres sont spacieuses et les salles de bain parfaites. Cuisine extrêmement bien équipée. Un très grand salon avec trois canapés où on a pu s'affaler et rigoler des heures. Un grand jardin. Et puis le centre Nunayak à 100m en passant par le petit chemin, où rafting, spéléo, via ferrata et parapente nous attendaient. Bref, un séjour fabuleux que l'on est pas prêt d'oublier, avec un très gentil accueil ! Merci Sean. Merci beaucoup Laurent! C'était un plaisir de vous accueiller a chez nous! Ce chalet est idéalement situé : la vue est magnifique, le calme est total tout en étant juste au dessus du centre du village ! Le jardin est magnifique et l'accueil de Sean et Julia plus chaleureux que tout ce que nous avons jamais connus. Nous avons profité du grand confort du chalet au retour des fabuleuses randonnées au départ de Sixt. Le rêve ! Merci Isabelle!!! Et merci pour laisser le chalet propre et rangé. Lac Bleu in Morillon (10 minutes away) has a beach area and safe swimming in a natural lake. There is also a large outdoor swimming pool in Samoens with slide. The fabulous lakes of Geneva and Annecy are within 90 minutes drive from the chalet and offer safe swimming, cycling and walking. Geneva airport is just over an hour away and is served by a ski-bus service 4-6 times per day during the winter. The nearest railway station is Cluses (30 mins) which is served by all services. Private transfers are available at any time of year for an additional charge. The chalet is a 2 minute walk from the village of Sixt Fer a Cheval and about 5 minutes drive from Samoens. Chamonix is 1 hour away. Annecy is 1.5 hours. Outside of the ski season there are numerous outdoor activities in the immediate area; Rock climbing - all grades from beginner to expert. Hiking - easy valley walks to all-day and multi-day mountain excursions. Rafting, canoeing, hydro-speed - all start from the village with several guide companies. Via Ferrata - just a few minutes from the chalet with a bridge and ladder section! High-wire adventures in the trees. Booking Notes: Please see our website for full booking procedure and terms and conditions. Changeover Day: Changeover day is Saturday, but we are flexible whereever possible and we can accommodate short breaks all year around. Notes on prices: Summer Prices are based on groups up to 11 people. For smaller groups of 7 or less, please see our website or contact us for a quote. Please see our website or contact us for prices on catered and B&B holidays. Winter Prices shown here are for renting the whole chalet on a self-catered basis, per week. Please contact us for catered prices where the minimum stay is 3 nights and there are discounts for children. We have part-availability on many weeks which cannot be shown on this availability calendar. Only fully booked weeks are shown. Please see the availability calendar on www.sixtalpinechalet.com for full details.